Is this the real cover? I have no idea, to be honest, but I just saw it on goodreads and decided it looks legitimate. I think it’s real. Actually, I’m 99.9% sure it’s real now. So let’s review it! 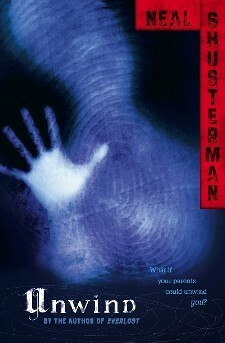 I think I prefer the first cover more, it’s slightly more creepy in my opinion, with the whole faceless, zombie-esque person. I have a feeling this guy is Cam on the cover, since he doesn’t look anything like Connor or Lev in my head, and hopefully is not Risa. But it’s still awesomely creepy, and just makes me so excited. I can’t help it, I love this series. And the summary looks awesome! It’s pretty long, just to warn you, but read it anyway. “In a society where unwanted and troublesome teens are salvaged for their body parts, Connor, Risa and Lev continue to fight against the system that would ‘unwind’ them. Thanks to their high-profile revolt at the Happy Jack Harvest Camp, people can no longer turn a blind eye to unwinding. Ridding society of so-called troublesome teens might be convenient, but its morality has finally been brought into question and a new law passed. However, unwinding has become big business, and there are powerful political and corporate interests, not to mention the illegal ‘Parts Pirates’, that want to see it not only continue, but expand. Connor, Risa and Lev each struggle to rescue as many AWOL teens as possible and offer them sanctuary. But life at the Graveyard is hard, rivalries bubble under the surface and the cracks are beginning to show. Well, I’m freaking excited about this book, my only worry is that it won’t be as good as the mindblowing first book. But I was worried in the same way for Everwild, and that proved to be awesome. And again with Everfound. 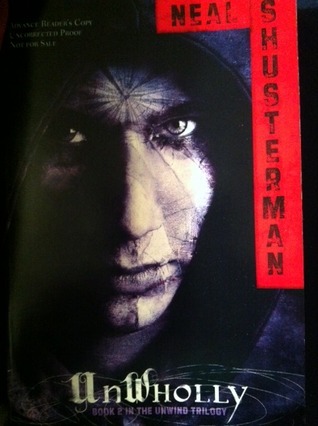 I guess I just have to trust Neal Shusterman in being the awesome writer he is and making this awesome. Urgh! I want to read it so bad! And if you came here and just read through all this and don’t know whether to read Uwind or not? GO READ IT! NOW! GO! GO GO GO GO GO! Also, did any of you see the short film MainstayPro made for Unwind? I loved it. If you don’t know what I’m talking about, go ahead and look them up. They made a ton of videos for the Hunger Games before the movie came out as well. Sorry, that was really random, but I guess I’m a pretty random person. Ah well.